How is your Wednesday going so far? I'm currently having beach withdraws so reminisce about a time where I was only steps away from the beach. 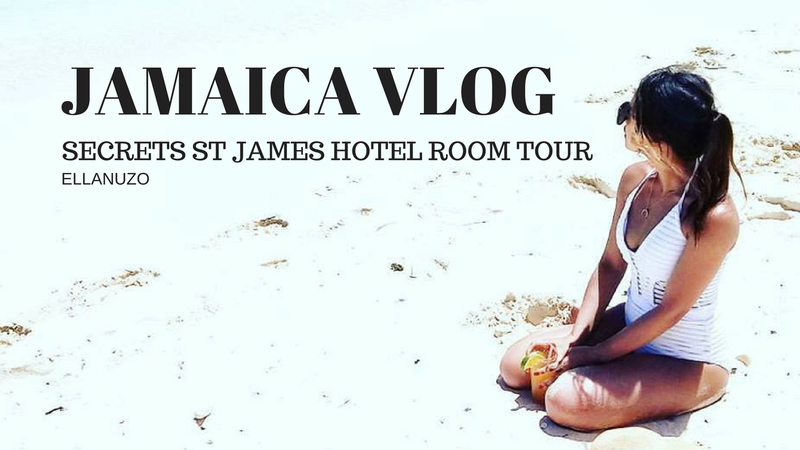 What better way than to do a little recap of my trip down to Jamaica. I thought I would also do little review of the resort we stayed in. We booked an all inclusive trip through Sunwing and stayed at the Secrets St James Hotel in Montego Bay. Patrick & I flew down done for some much-needed R&R & also to celebrate my birthday. As we both have fairly hectic work schedules, we decided on an easy going vacation. Although I had the full intention of vlogging the whole trip, as the days passed I did end up slacking. I'll blame it on the fact that I had fully embraced the relaxed vibe of the vacation. 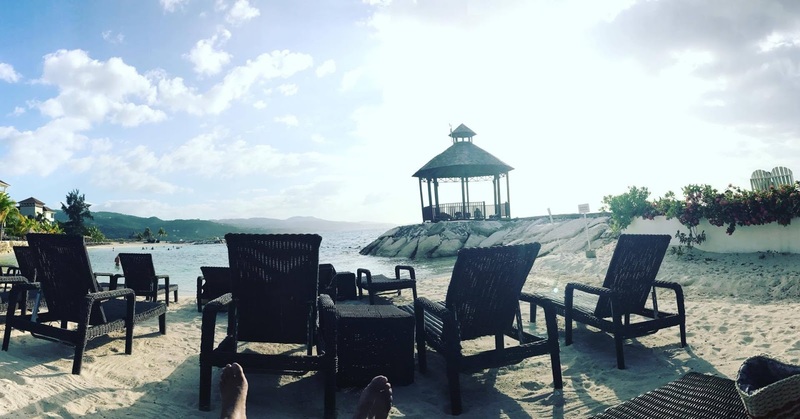 Honestly, most of days consisted of laying by the beach with tasty cocktails, nachos, and ample amount of jerk chicken on hand. I think it's great mixing vacation styles from time to time. Although I love sightseeings and discovering new cities and town, it was a nice change to just relax and lay on the beach. It's definitely different from all the other hectic and action packed vacations we've had in the past. As I mentioned above, we booked our trip through Sunwing and stayed at the Secrets St James Resort, which is located in Montego Bay. The resort is only about 15-20 minutes away from the airport. The resort was rated as a 5stars resort, which I do I agree on. It's also a adults only resort (18 years + ).We paid just under 1800$ CAD each for a 7night stay. As the name suggest, the price was all inclusive and include the flight, transfers, accommodation as well as all the meals and drinks. As we arrived at the hotel, we were immediately welcomed and the bellman took care of our luggage. There was even a cute doormat that said: "Welcome home". I love cute details like that! The check in process was quick and simple, and they even offered us champagne during the check in process. Talk about a chic check in! The lobby though was fairly small (I usually associate all inclusive resorts with a grand lobby). But this just made for a more intimate check in process. The great thing about this resort is all the rooms are suites with either a balcony or a patio which means that space isn't an issue. This particular hotel is described as having a colonial style (their sister hotel Wild Orchid has more of a contemporary style if that's your preference). Although the decor definitely has a colonial vibe, I didn't feel as though it was outdated. The room features a soaking bathtub, a rainfall shower head, a mini bar, and king bed, a balcony with the view of the pool and beach (AMAZING) and many more amenities. Click here if you'd like to know have more room details. Although the Secrets St James shares its amenities with the Wild Orchid Hotel, I personally did not find the resort to be overly crowded. Perhaps that's also in part due to our timing there. We went early June when it isn't technically high-season. The hotel grounds were well maintained and beautiful throughout. I honestly have no complaints. The beach, the sand, the decor and everything was aesthetically pleasing. They also had peacocks that randomly roamed around the hotel grounds. I was always fascinated every time I saw them casually wandering around. They also had a couple of parrots with an open cage (Bob & Rita (not pictured). Also, I think it's also worthy to mention that they had swings throughout the resort. They basically rock you to relaxation. This bed swing was my favorite though! It's literally a bed hanging from a tree with the view of the ocean. Now that's what I can bliss! Fresh Coconut, My happy face when I see a Mai Tai, and a bob marley drink. I read several posts prior to going to Jamaica to see what the tipping situation was, and from what I gathered, tipping is to your discretion. We ended up converting our money into USD (that seemed to be the consensus from reading the forums) and had asked the bank for many 1$ - 5$ bills. Although technically all taxes and services charges are included in the package, personally I was more comfortable providing a tip for the workers. Generally, most of the staff were extremely friendly and welcoming that I think they truly deserved it. They were all so appreciative when it came down to giving them a small tip. Basically, for drinks, Patrick & I would tip 1$ USD each. During meals, depending on the service we would tip between 2-5$ USD, and for the turn down and housekeeping, we would tip 5$ USD. As much as I loved this resort and overall found the service to be quite good, there were a few hiccups. First, our toilet broke a few times, and although I'm not extremely technically with the mechanism of a toilet, I think it had something to do with the flusher. This wasn't really a hindrance because it was fixed quite quickly and the housekeeper also left us a note on to remedy this (by pressing a certain button twice.) Again, not an expert with the exact parts of a toilet, but her advice seemed to do the trick. Also, our mini bar wasn't consistently refilled, but I think that had more to do with the times we put the "do not disturb sign", as the bar is refilled during a certain time period. Also, we did encounter a few staff members that were not as pleasant others, but honestly it didn't phase us. There were probably only one or two we had come across, and maybe they were simply having a bad day themselves. Like I said earlier, most of the staff were extremely friendly and welcoming. note, I thought I'd end this post with the good aspects of this resort. 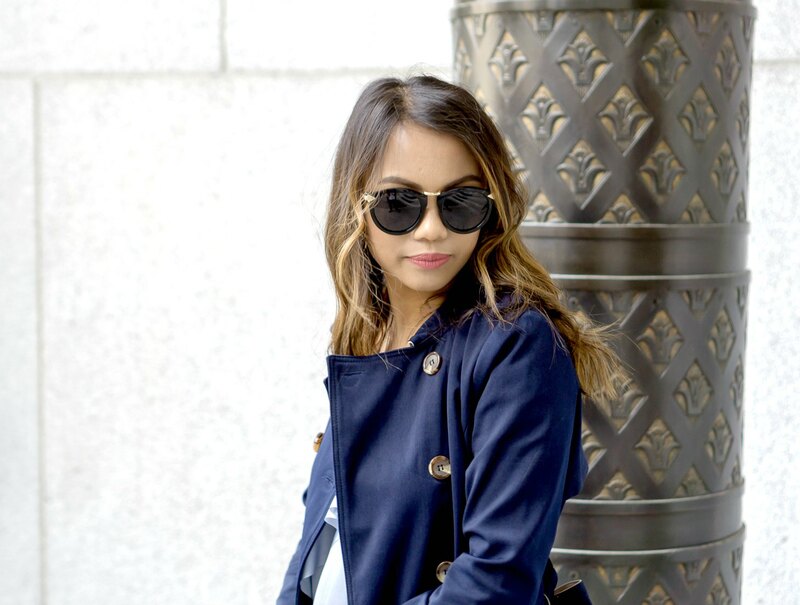 Registered Nurse moonlighting as a petite lifestyle blogger trying to navigate life in her twenties.